Are you still there? Or did I bore you to death with my excitement over our new ceiling in the basement? You can read The Patriotic Basement, Part I Here. Today, I'm excited to show you our wall treatment and the entertainment wall. Hopefully this will prove to be a bit more exciting. 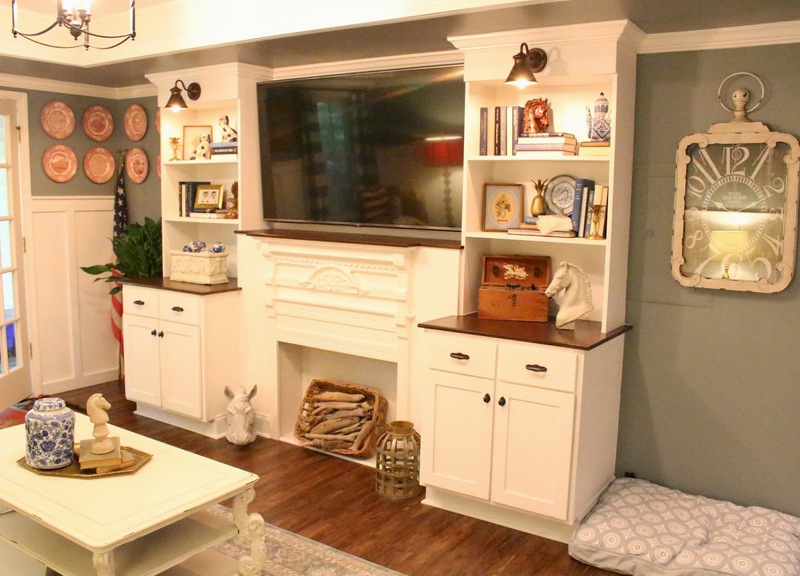 A boring, dingy, beige basement. For the walls, I wanted to do a bold wall color, so we chose Ralph Lauren's Ashlar - a rich blue grey. 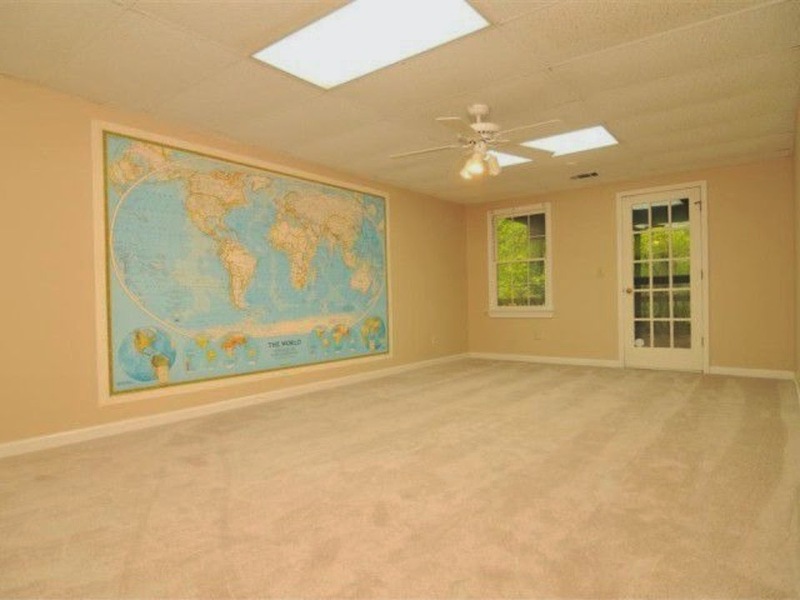 This color would also help fulfill Kev's desire for a 'Merica themed basement - yet still felt sophisticated. We knew it would be too dark to be the only color for the basement, so we decided to pair it with a crisp white board and batten, trim, and cabinetry. 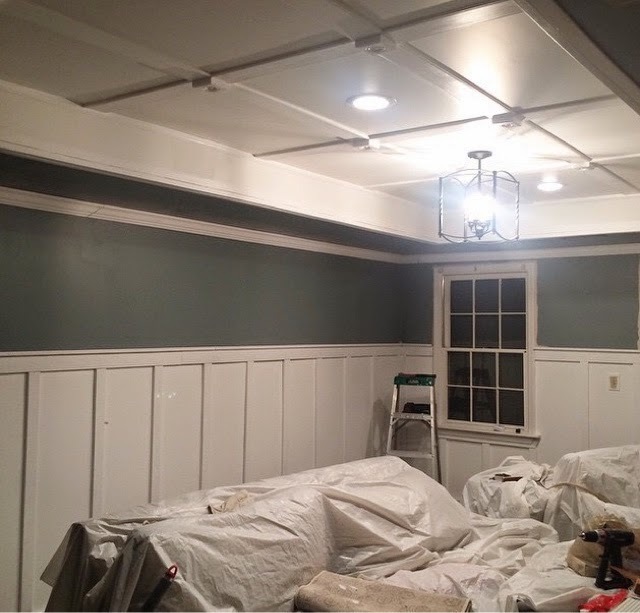 The board and batten was actually pretty painless to install, it was all the painting and the caulking that took up the majority of time. We love the way it pops against the bold blue grey walls. Here you can also really see the trim work and the tray ceiling. 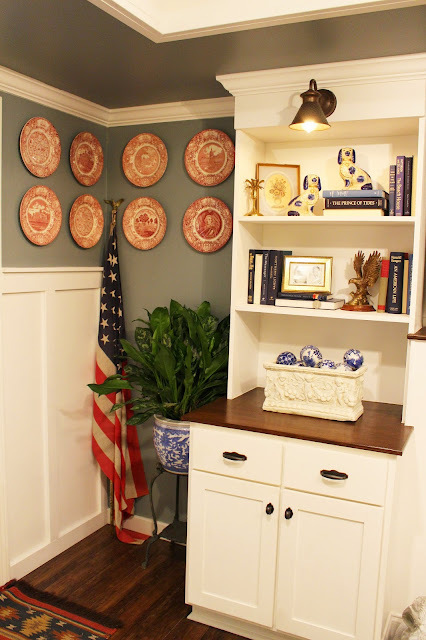 We decided to paint the first level of the ceiling the same Ashlar blue. I think it made the room feel a little more luxe. And now, on to my favorite part of the room...the entertainment wall. As I mentioned before, Hubs really wanted a big screen television. In all honesty, I don't love the idea of a TV being the focal point in any room (our other two TVs are tucked away in armoires), so I wanted to do something tasteful around the monstrosity. I wasn't quite sure what "something tasteful" really meant until I saw this gorgeous fireplace facing at an antique store. When I spotted it, something just clicked. THIS would be our focal point. 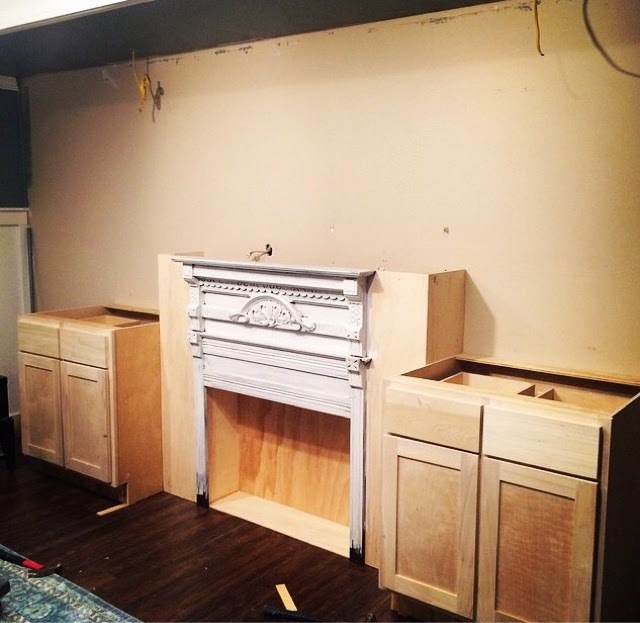 We decided to build a faux fireplace with builtin cabinets and shelving on either side. 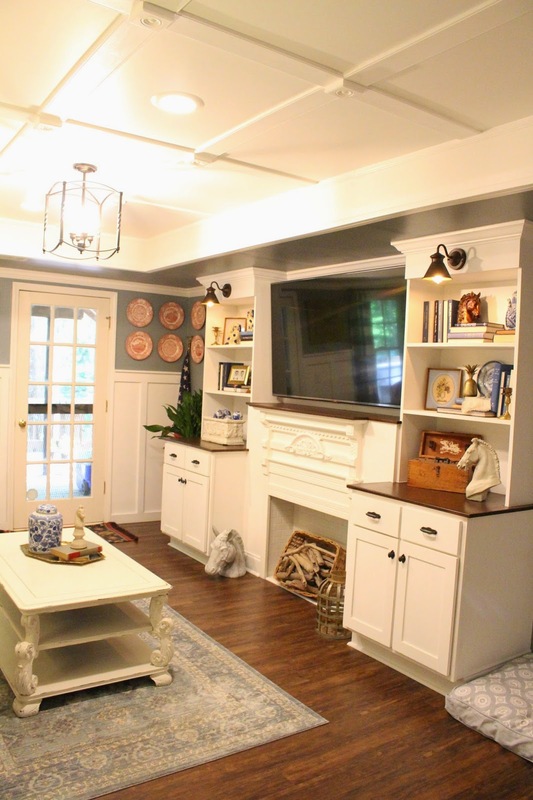 I wanted lighting above the shelving and electrical moved behind the television so no cords showed. So Hubs got to work. 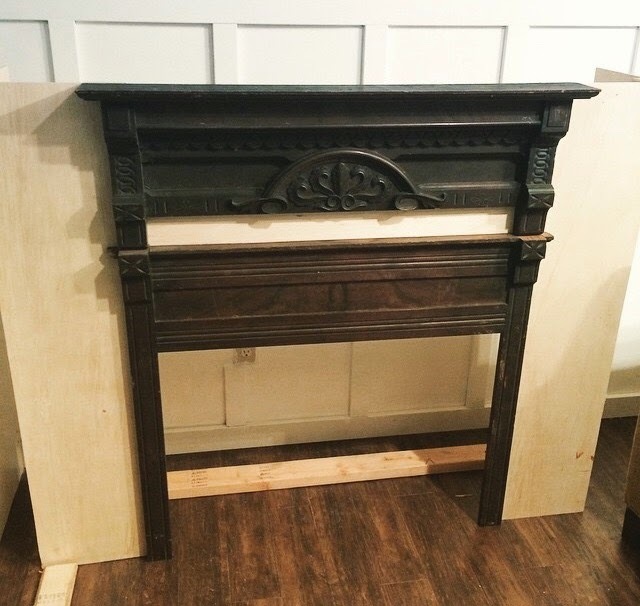 Hubs built a fake surround around the fireplace and we purchased the shaker style cabs from a local store, Builder Surplus. 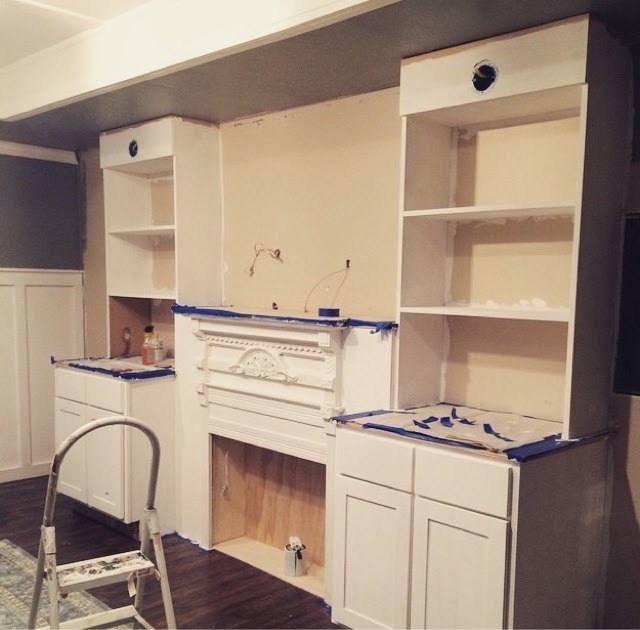 Once the cabinets were in place, Hubs built a counter top for both cabinets and for the mantle out of stained wood. Then the bookshelves were constructed above the cabinets. 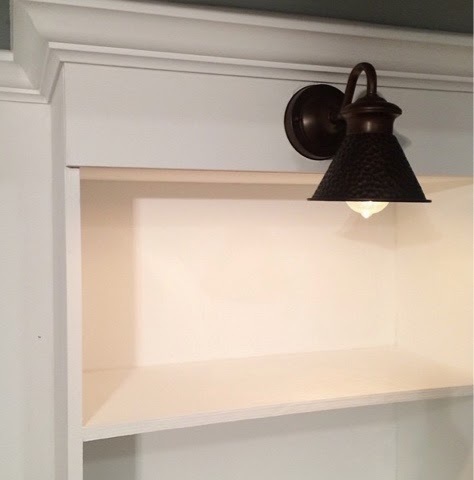 My favorite detail is the sconces we wired up and mounted above the bookshelves. Everything got trimmed out and painted the same crisp white we used for the ceiling and the board and batten. 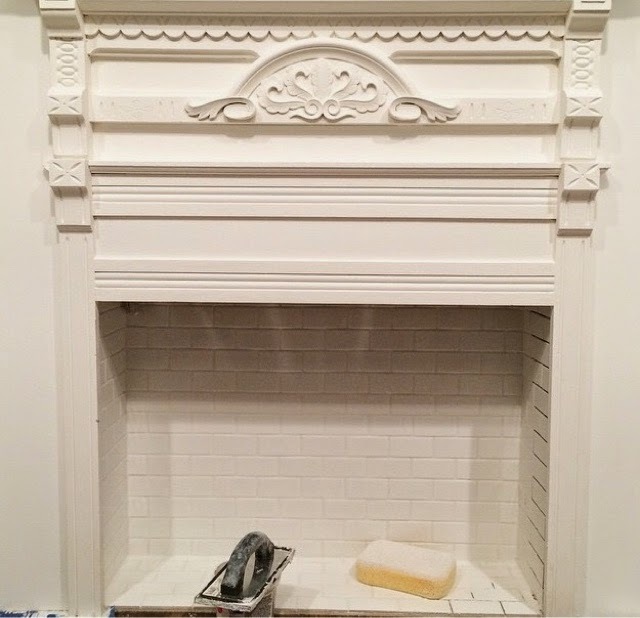 Finally, hubs used small subway tile to mimic the look of an actual fireplace. 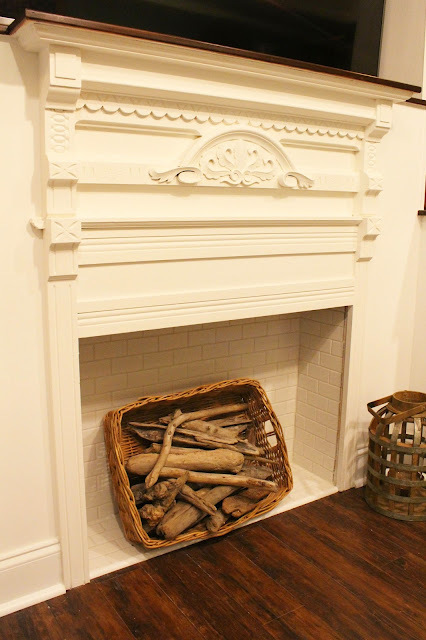 It should be noted that we did keep electrical wiring in the fireplace should we choose to ever put electric logs in there. For now, I look the look of my driftwood filled basket. 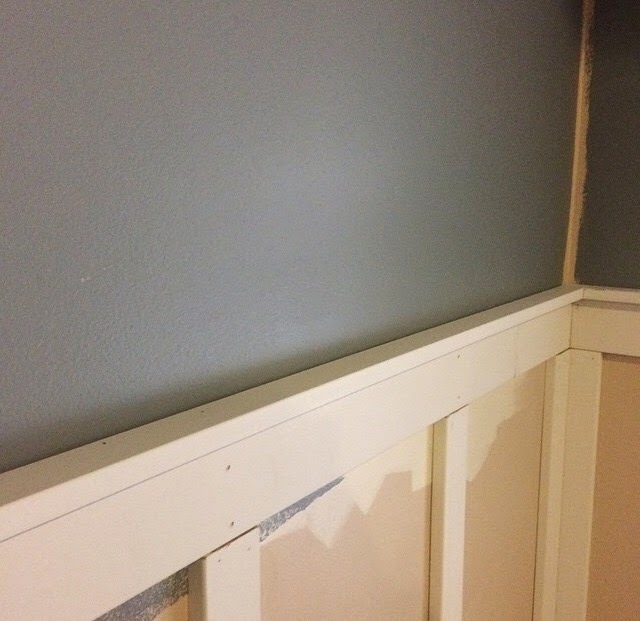 Once everything was built, painted, stained, and caulked - The TV went in (all 65 inches) with only a half inch on either side for wiggle room. I was sweating BIG time while trying to help Hubs mount this thing. I was CONVINCED it wasn't going to fit - or I was going to drop it. I may have shed three tears over the whole ordeal. But once again, Kev proved me wrong. Not even five minutes after the TV was mounted, I began filling the shelves with some of our favorite things. If you look carefully, you will spy a brass eagle, brass pineapples, horse heads, blue and white porcelain. 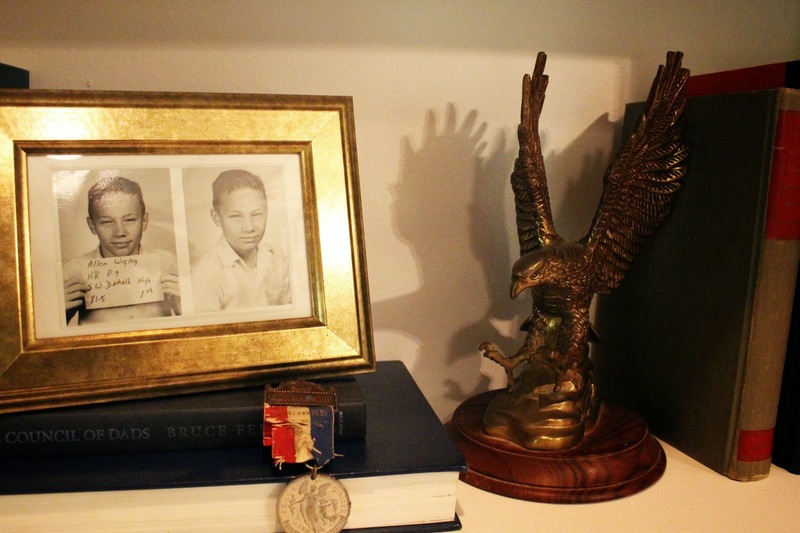 I especially love these framed school photos of Kev's dad. I mean, don't they look like a mugshot? HILARIOUS. The majority of the book spines are blue. I went through Goodwill on a day that the books were heavily discounted and picked out any book that I would like to read... that had a blue spine. This was an easy and eye catching way to decorate the majority of the shelf space. 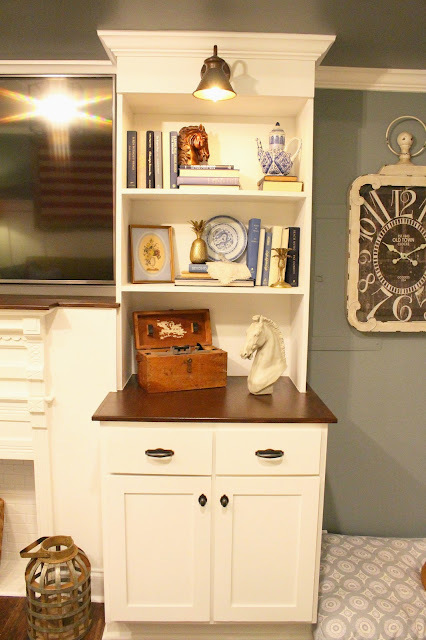 That wooden box is one of Hubs' favorite Estate Sale finds. It's an antique construction level. How appropriate! Also, if you look to the right of the shelf, you might notice our electrical box. 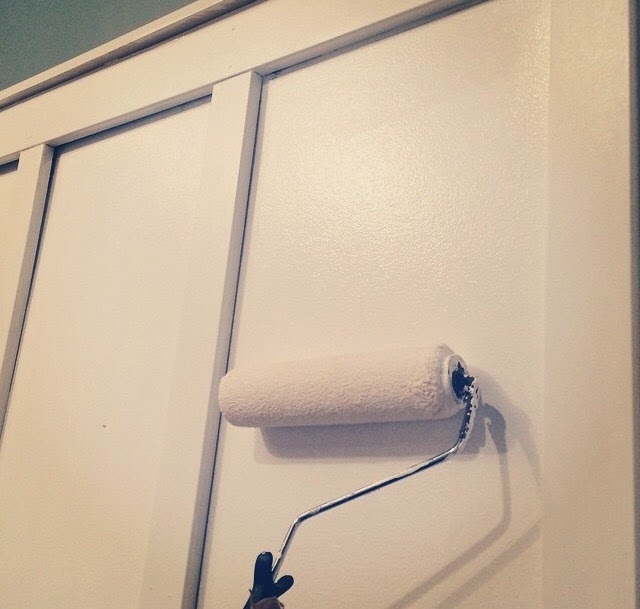 We painted it the same color as the wall so it would blend in. 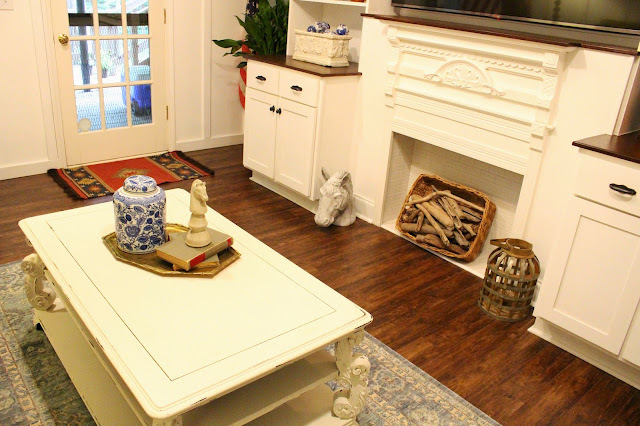 I love the way the cabinet countertops and the mantle top contrast with the rest of the builtin. We used this same treatment on our dry kitchen (will be posting about that soon). To the left of the entertainment builtin is our little 'Merica corner. We found this vintage flag at an estate sale. The plates are Wedgwood History of Georgia plates. 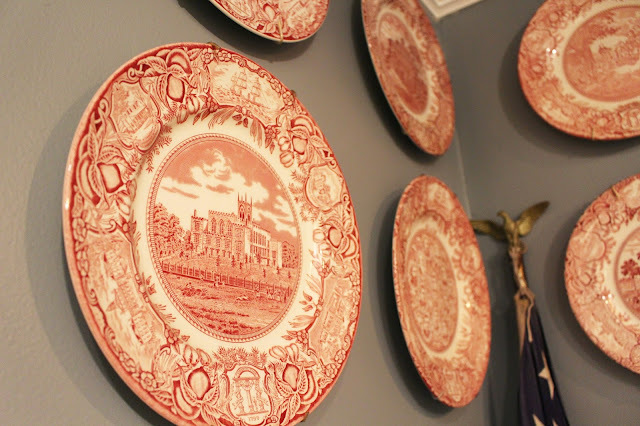 Each plate tells a different story about our State's rich history. My mom has been giving them to me for years. I'm so glad to have the perfect place to display them now. Woo! It's a far cry from a beige box now! The board and batten was around $380 for the room. Can't wait to show you guys the sitting area next! Talk soon, friends! It really does look amazing. And my father has some school pictures like that too. Y'all did a great job! My husband would love this room - he is an Army veteran, and we are now living back home in Georgia. Happy weekend!